This young man is a winner. Everything your read about him is that he “wins the big game in the last two seconds.” Captain of the state champion Alemany High School basketball team and knows what it is to win it all. A great pick for AVC. KJ fits in very well with the deep and experienced AVC team as he is smart and has a great feel for he game. Most importantly, he can do so many things. Out of high school, KJ did not receive the university offers that were satisfactory to him. He joined a local prep school out of high school and felt it was helpful for him. He got to play against bigger, stronger and experienced competition. After a year at the the prep school, he was ready for the next level. 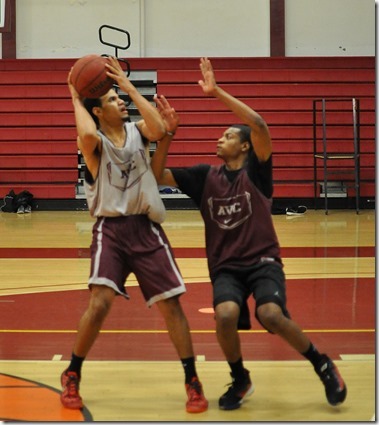 He had been watching Antelope Valley College and after working out with the team, he was sold. KJ’s major is Kinesiology and his short and long term goals are a college degree and then a well paying job. Keep and eye on this guy. He is going to be a special player at AVC.